Ralfe Whistler, born in Cornwallis Gardens, Hastings now lives in a large bungalow overlooking the rolling Sussex countryside. “You found me all right then?” he called in greeting as we (Jonathan Broughton and John Humphries) arrived. He picked out two large logs from a pile of chopped wood. “You can park in front of the barn.” He pointed to a space in front of a large red brick wall. To the right, stuck into a hedge, two flags waved in the breeze. National colours, certainly, but which countries? His open front door had, as its knocker, a Dodo’s head. In the hall stood a giant Dodo with a pot plant attached to its back. From the ceiling hung a flying Dodo made out of metal scraps and odd bits of material; on a glass-fronted bookcase stood Dodos made from plastic, ceramic, wood, porcelain, stone, bronze, glass and pewter. Another large Dodo, carved in wood, sported a red tie. Prints and pictures showed Dodo’s running, laughing, eating, loving and being witty. And this was just the hall. 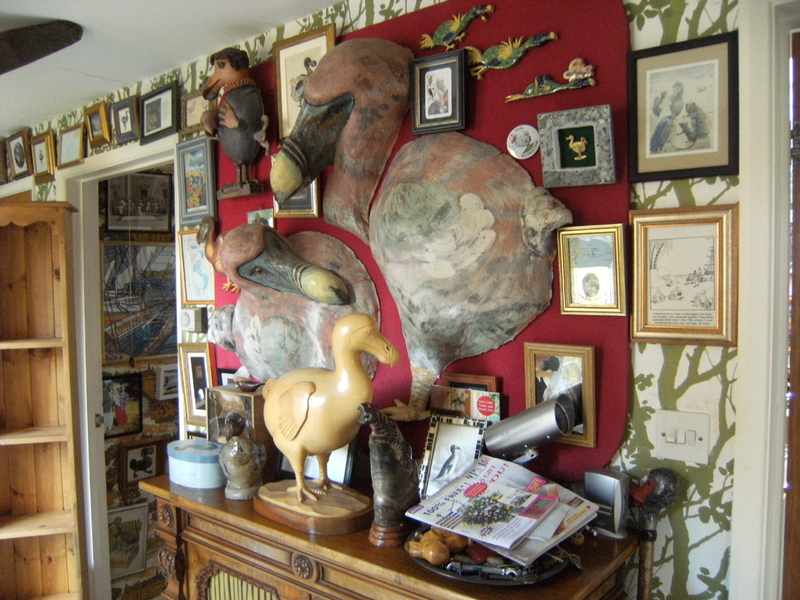 As you may have guessed, Ralfe Whistler is a passionate collector of all things Dodo. He describes himself as a ‘specialist in artifacts, ephemera, books, sculptures, prints and paintings of the Dodo’. His large lounge, which boasts two open fires on which he placed the logs, overflows with Dodo ephemera. As does every room in the house. “I like to think I’m keeping the art of the Dodo alive,” he mused. We sipped coffee from Dodo mugs. 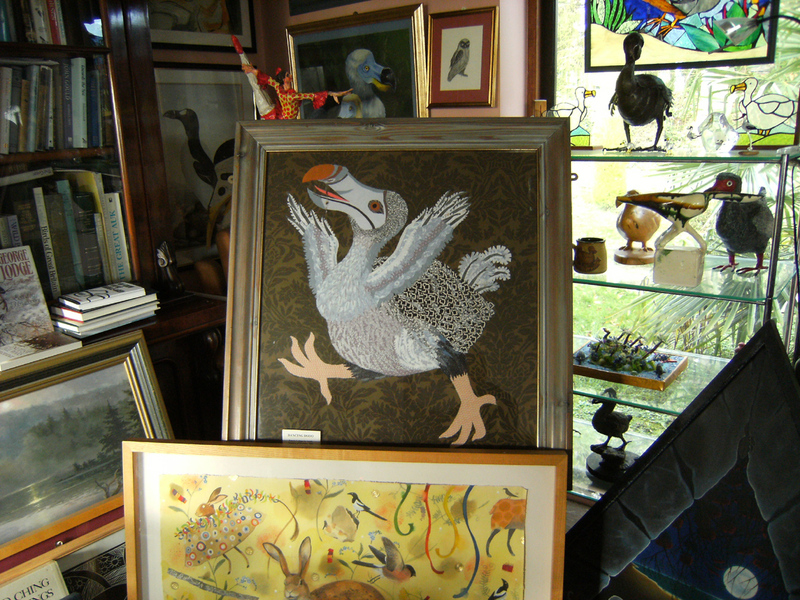 “I reckon I’ve got examples of Dodo art from about thirty-five countries.” Stained glass Dodos hung in front of the windows, and fractured the light with colour. 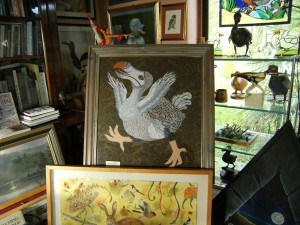 At our feet, a thick rug, woven in Cuba, featured a happy Dodo surrounded by lush vegetation. “When the London Dodo died, it was stuffed and kept in the Ashmolean Museum at Oxford. By 1755, it had decayed so badly that they removed the head and the right foot and burnt the rest.” The little that is known of the Dodo has come from the extraction of DNA from these miniscule remains. The Dodo was native to the island of Mauritius in the Indian Ocean. Flightless, as no natural predator hunted it. When Dutch settlers landed around 1600, who brought dogs and the rats who scavenged on board ship, they found it made easy sport for bored sailors. The Dodo went extinct before 1700, less than a century after its discovery. 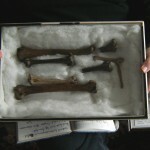 Ralfe has a small collection of fossilised remains. ‘Leg bones and a small sliver that is part of a wing.’ The Dodo stood about a metre tall and weighed around forty-four pounds. As a species it is related to pigeons and doves. The Latin name for the Dodo is Raphus cucullatus. Ralfe’s father sparked his interest in birds. 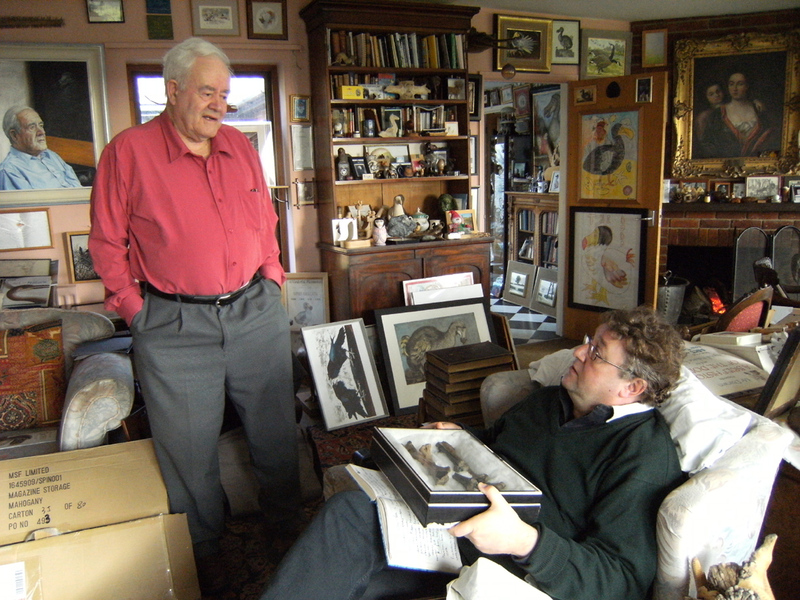 ‘My dad’s bird collection numbered fifty thousand.’ He smiled wryly at our looks of astonishment. ‘In those days, the nineteen twenties and thirties, people didn’t think about conservation and the extinction of species as they do now. He kept them in the barn.’ He pointed to the large red brick building. 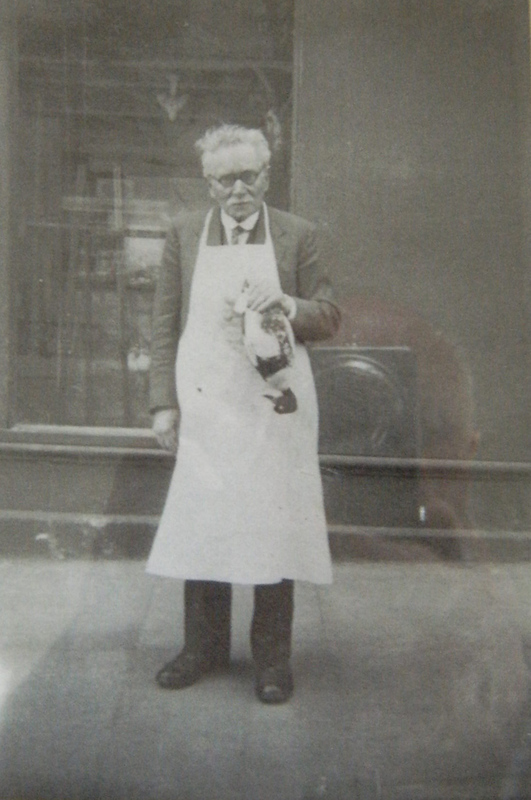 Ralfe’s early interest in ornithology led him to George Bristow’s shop in Silchester Road, St. Leonards. By this time, the early nineteen forties, George was an old man. He taught young Ralfe the craft of taxidermy. ‘George’s shop was so interesting. There was always something going on. He had a great collection of guns.’ Ralfe showed us the three specimens that he had worked on under George’s tutelage. One of them was a starling. ‘I wasn’t very good at it. My hands are too big. 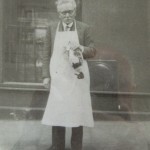 It’s such delicate work.’ Ralfe took the only known picture of George Bristow, (which we featured in the article The Scandal of the Hastings Rarities in the December 2011 edition, number 81), on his box Brownie camera. 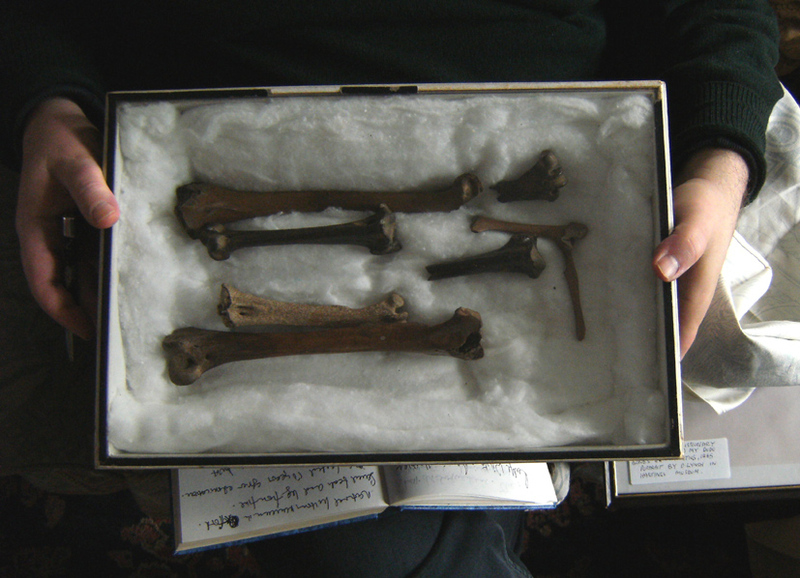 Which, we wondered, in his vast Dodo collection, was Ralfe’s favourite? 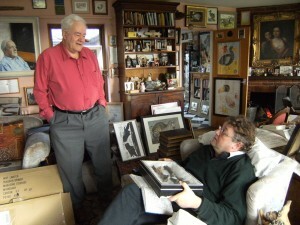 His granddaughter began cataloguing his collection, but gave up when she reached four hundred. Such an extensive collection merits its own special museum. Many of the hand-made exhibits are exquisite, unique and delightful. Ralphe gave us each a tea towel as a memento of our visit. A large blue Dodo adorned the front. Outside, he pointed out two huge eucalyptus trees from Australia. ‘I planted them when they were saplings. I’m a bit worried about them now, they’ve grown so tall.’ Perhaps, I suggested, import some koala bears to nibble them. And the flags in the hedge, which countries did they represent? [Interview, February 2012, by Jonathan Broughton; photos by John Humphries]. Love this article and hope I can meet Ralfe someday as my nickname is Dodo. Maybe he can add me to his collection.??? ?I live in Bombay India, I’m a performing artist and corporate trainer. All the best! It is all so interesting and here is a dodo lover in Dunedin, NZ! I would be most grateful if you could put me in touch with Ralfe Whistler, as I would like to visit his collection of Dodo artefacts. I was brought up in Mauritius and visit there on holiday quite regularly and my next visit could be made much more rewarding if I could find out more about the subject.